The thermal detector incorporates a single centrally positioned NTC thermistor that continuously samples temperature variations in the protected area. These detectors are designed for open area protection and must only be connected to conventional control panels. The centrally positioned red LED indicator provides 360© visibility and thus does not require any orientation during installation. An in-built magnet test allows easy activation to verify correct functioning of the detectors on site. Via the VPU100 it is possible to read the production date of each device. 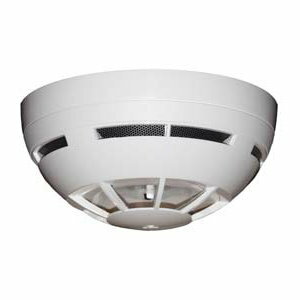 The S3500 high temperature detector meets the requirements of EN 54-5 class B and provides the highest level of protection when smoke detection is unsuitable.